Me and Lloyd Miller at Kennedy Club Fitness. He plays racquetball three times a week and beats players 40 years younger than him. A ranger passing by took this photo of three generations of Miller men – Lloyd and his son, Todd, and grandson, Blake – atop the 11,500 foot Black Rock Pass in Sequoia National park. Getting older is all about taking it easy, relaxing and slowing down – right? 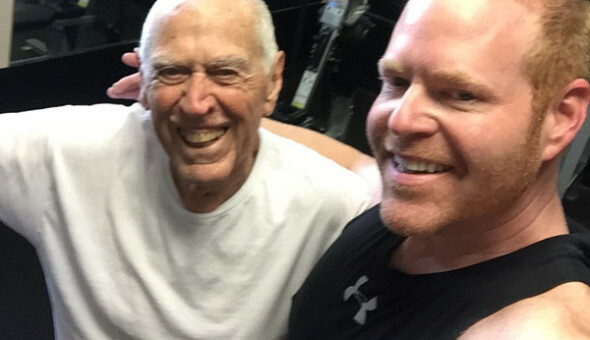 For some, this may be true, but not for Lloyd Miller – an active 89-year-old whose regular exercise routine keeps him fit, active, healthy and happy. Born and raised in Burbank, Lloyd served in the United States Army Air Force before starting a 34-year career in law enforcement at the age of 22. He has been married for 47 years to Muriel, a self-described “Army-brat” who was born at the Fort Knox military base. They met while he was working in law enforcement in Long Beach and she was an emergency room secretary at the local hospital. It was around this time that Lloyd started paying more attention to his physical health. The couple combined their households and raised their four children together – Muriel’s sons, Jeff (deceased) and Doug Bowen, and Lloyd’s son, Todd, and daughter, Melissa. 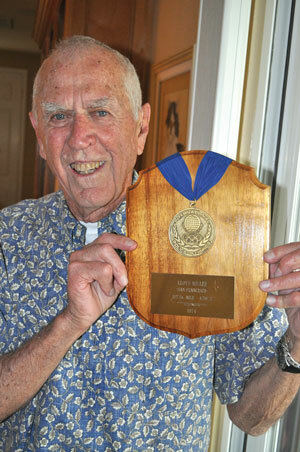 Lloyd Miller shows off the plaque he earned for taking first in the mile run at the 1974 International Police Olympics held in San Francisco. Photo by Meagan Friberg. With his new-found health, Lloyd soon began training to run marathons. One of those was in Orange County and, at 3 hours and 18 minutes, qualified him for the Boston Marathon at the age of 50. When the couple made the trip to Boston, temperatures reached upwards of 90 degrees and, succumbing to dehydration, Lloyd was unable to finish. Lloyd also became an outdoor adventure enthusiast and began mountain climbing, backpacking and hiking, venturing out on solo trips in addition to yearly outings with his son, Todd. One of his solo outings involved Muriel dropping him off near the Sequoias, backpacking nearly 85 miles, and exiting at Independence where he caught a bus ride home. Now in his late 80s, Lloyd’s days of solo backpacking are over, but he has more than a few stories to tell about his time on the trails. When asked if she ever worried about her husband when he set out on his adventures, Muriel responded with a quick smile. 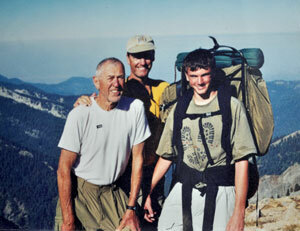 He has climbed Mount Whitney four times, twice solo and twice with his son. In his early 70s, the father and son climbed Mount Reiner, described by Lloyd as “probably one of the toughest mountains in the 48 states.” Their guide had led clients up the mountain 105 times previously. Lloyd laughs when he recalls the guide’s response when he was asked who the oldest person he’d ever take taken up was. He has also climbed the 14,000 foot Mt. Shasta. The climb, led by two guides leading five clients, was in June and started at 2 a.m. at about 7,000 feet, in the snow, and took 12-13 hours to reach the peak and return to base camp. Retired at 56, Lloyd and Muriel moved from Southern California to Lake Elsinore, near Chico, where they lived for 16 years before moving to Lincoln, near Sacramento. Two years ago, they moved to Paso Robles to be near their daughter, who lives with her family in Atascadero. Their family has expanded to include seven grandchildren and two great-grandchildren. Doug is a longshoreman in San Pedro, while Todd is a periodontist in Irvine and Melissa (Bresnahan) is retired after years of being an administrator and teacher in various schools throughout San Luis Obispo County. Lloyd’s active and adventurous nature has continued on through his children and grandchildren. As the years passed, Todd brought along his son, Blake, on the hiking trips; he has also hiked the Popocatépetl in Mexico; hiked Mount Kilimanjaro, the highest peak in Africa, with daughter Sydney, and recently hiked the John Muir Trail with his wife, Donna. Melissa’s daughter, Megan, just took up running and completed her first 5K. She plans to run the SLO Marathon in March. 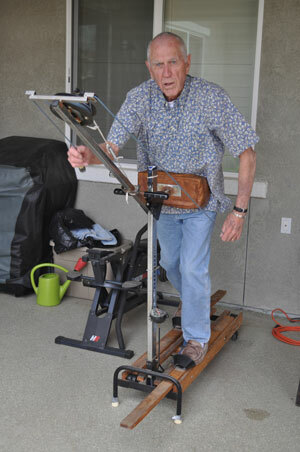 Lloyd Miller of Paso Robles works out on one of the original Jane Fonda’s Healthriders, a piece of equipment that his wife, Muriel, said she ordered for herself decades ago before Lloyd took it over! Photo by Meagan Friberg. When not spending time with his family, Lloyd can be found working out or playing racquetball at Kennedy Club Fitness in Paso Robles. He exercises “basically, seven days a week,” keeps a fitness diary and, in this past year, he’s only missed about 12 days. A typical day for this go-getter includes a half-hour on his backyard patio with exercise equipment – he’s had some equipment, such as his Nordic Trac, for decades – followed by breakfast. 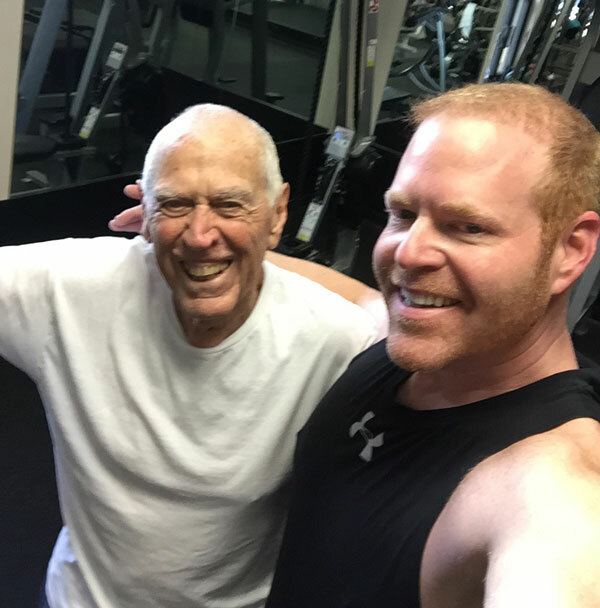 He follows that with a couple of hours at Kennedy Club Fitness in Paso Robles – three days a week he plays racquetball and the other days he does weight training and conditioning. Even the effects of Dupuytren’s disease – described on mayonclinic.com as a thickening of the tissue just beneath the skin of the palm and extending outward that pulls fingers into a bent position – have not slowed down his exercise routine. In fact, many of his ailments have challenged this fitness buff to not only keep going, but they’ve also spurred him on to try new ways of working out. Take, for instance, the way he deals with arthritis in his knees, hips, and lower back. Lloyd said that as he’s aged, body core exercises – stomach, back, stretching his hips – are very helpful. At home, he uses 5 or 10 pound ankle weights with his leg lifts. When walking around the neighborhood, he carries 20 pounds of weights in his backpack for added resistance. A regular on the racquetball courts while living up north, Lloyd said it’s a great way to stay active and meet new people. So, when the couple moved to Paso Robles, it wasn’t long before he started hanging out at Kennedy and joined others on the court. An average of six or seven people usually show up to play doubles, all of them younger than Lloyd, with the closest in age being in his mid-70s. –Original story reported by Meagan Friberg – writer and editor, of Central Coast Active. I updated and edited it.